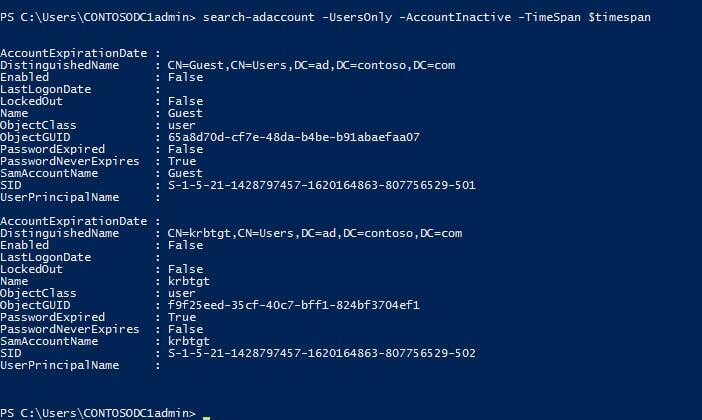 Inactive Active Directory (AD) user accounts can pose a security risk to organizations, in situations such as when former employees still have active accounts months after leaving the company because HR failed to inform IT, or accounts might be created for a particular purpose but never deleted after the event. Whatever the reason for the existence of such accounts, Active Directory can quickly get out of control, in turn making your systems harder to audit and less secure. The PowerShell module for Active Directory allows system administrators to query Active Directory and generate reports using the resulting data. The AD module for PowerShell is installed by default on Windows Server 2012 domain controllers, or alternatively you can download the Remote Server Administration Tools (RSAT) for Windows 8.1 and install the module using the command below. It’s worth noting that unlike the LastLogOn attribute, LastLogonTimestamp is synchronized between domain controllers, but can be 9 to 14 days out-of-date, so you should bear this in mind when processing your results. As with any other PowerShell cmdlets, the results can be piped to Out-GridView, or to a comma-delimited file so that the results can be imported into Excel. Netwrix Auditor includes the ability to detect and disable inactive user accounts across all supported versions of Windows, and the results are integrated into the database, reporting and notification features of the product so that additional scripts don’t need to be run and maintained separately. Netwrix Auditor can disable inactive accounts, set a random password, move accounts to a designated Organizational Unit (OU), or delete the accounts. Now it’s time to leave your opinion in the poll below. Keep in mind that there’s only one correct answer!